This PDF 1.7 document has been generated by Adobe InDesign CC 2017 (Macintosh) / Adobe PDF Library 15.0, and has been sent on pdf-archive.com on 03/05/2017 at 09:01, from IP address 98.145.x.x. The current document download page has been viewed 2516 times. File size: 2.2 MB (2 pages). 1) Ride on the road. increases your risk of being hit by a car. looking before crossing the sidewalk. The rules of the road are for everyone. •	First come, first served. •	Always ride the same direction as traffic. •	Yield to traffic before entering a road. •	Yield to overtaking traffic when changing lanes. •	Obey all traffic control devices. 3) Integrate in the intersections. •	Always use the lane that serves your destination. •	Turn left from left turn lanes. •	Never ride straight in a right-turn-only lane. left into the main traffic flow or lane. •	The crosswalk is the WORST place to cross a busy intersection. You are part of the system, you need to be predictable to others. Communication makes you predictable. Signal turns and lane changes. 6) Be mindful of your surroundings. your cues from the whole environment. Never let paint think for you. 5ft of a parked car. The most common reasons to leave a bike lane. fit within the same lane. 7) Understand how traffic flows. 8) Want respect? Act respectably. position which makes things easier for yourself and your fellow road users. Be considerate of your fellow road users. But also demonstrate respect for yourself. motorists pass you when appropriate. queue and make them have to get around you after the intersection. 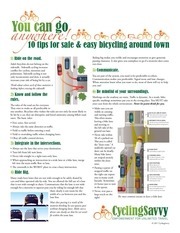 free video of this course segment at online.cyclingsavvy.org. Exit Ramps and Turn Lanes: traffic leaves your lane at speed. One road. Many Users. All of us are traffic. 9) Let it go: don’t escalate harassment. change a few minutes before. you to wait and enter the ramp to your right. Merging Lanes: traffic enters your lane from a ramp or merge lane. seen you or prepare to adjust your speed to avoid a conflict. Diverging Lanes: two roads intersect and the right lane diverges. everyone if you change lanes early. The next platoon of traffic can flow around you. 2) Control the middle lane. ramp, you will need to move into it. pace, repeat sections, and do so even if there are no instructors in their area. This file has been shared by a user of PDF Archive. Document ID: 00591749.